When creating a plan of analytics attack, you’re likely to encounter the terms ‘data strategy’ and ‘analytics roadmap’. Often (mistakenly) used interchangeably, strategies and roadmaps are not the same - but they are connected. Data migration and integration (will the data live in a datamart? These factors cumulatively give organisations a picture of what they want out of an investment in analytics. Many of these desired outcomes tend to be similar across all manner of industries and company sizes which makes sense, because businesses typically want the same thing: to learn why things are happening and determine how to optimise those things in order to increase revenue. Data strategies usually get endorsed at a high level - few senior management teams are going to say, ‘No thanks, we don’t want to optimise operations and increase revenue.’ The difficulty comes when you want to actually make a change in your organisation based on the strategic direction you’ve determined. That’s when you need an analytics roadmap. An analytics roadmap is designed to translate the data strategy’s intent into a plan of action - something that outlines how to implement the strategy’s key initiatives. Creating this kind of framework allows you to evaluate the potential value of each strategic initiative (as well as what the constraints would be) so you don’t end up squandering time and resource on the wrong projects. At a very practical level, the roadmap considers all of the different everyday activities that will need to occur in order to bring the data strategy to fruition, as well as the key milestones and dependencies you’ll need to keep in mind. To give an example, your data strategy might say ‘We want to build internal capability.’ You have a goal, but you haven’t outlined how you’re going to get from here to there. Your analytics roadmap would then determine what skills you need, what kinds of people you want to hire, what the timeframe is etc. You’re breaking down goals into actionable bite-sized activities. One of the most important components of an analytics roadmap is determining the phasing of these various activities. Rather than arbitrarily choosing a project to start on, you have to outline what needs to happen at what stage of the process in order to facilitate other activities down the road. How do I create a data strategy and analytics roadmap? There are many steps involved in creating a data strategy, but it is something that organisations can do themselves. Download Datamine’s free whitepaper on creating data strategies to learn more about them and begin the process yourself. 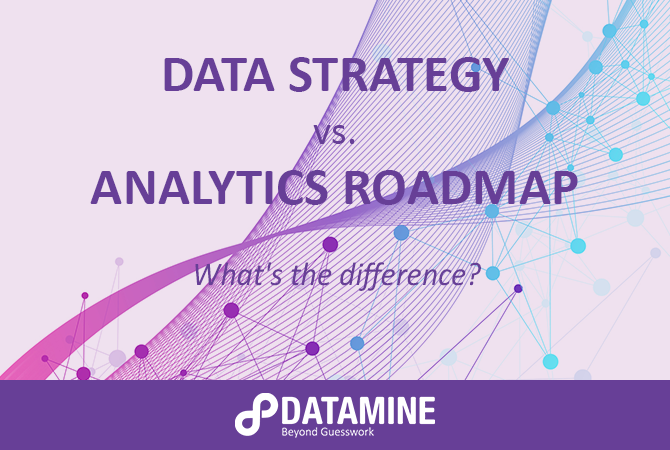 Datamine has decades of collective experience in helping organisations determine their strategic direction and what steps they need to take to get there. We’re happy to schedule a free phone chat with you to hear about your strategic goals and determine whether we can help you achieve them - click here to book a consultation with us, or here for a ballpark estimate of what an analytics roadmap might cost.